The mind, too, has uses, some of them quite lucrative. For any such use it must be trained, as a guitar must be tuned and handled with care. But the training of the mind for any particular use. whether it be to balance accounts or to plan cities, to make investments or to make poems, to nurse the sick or to argue briefs — any particular training, I say. is not education. Education is what advances the mind towards its end. The only reason the mind is “good” at any of those uses is because they are in keeping with its end. but the mind’s end is something higher and broader than any of them. Education has that broader object. Think of it this way. What a guitarist needs, to advance his instrument towards its end. is something a lot broader and deeper than just practice in one or another repertory. He needs musicianship. He needs that cultivated insight into music, without which he is a hack, and his instrument a failure, no matter what repertory he plays. Education is the mind’s musicianship. It is that without which no man. be he accountant or politician, businessman or poet, is anything but a hack. Education is that which, by advancing the mind towards its end, alone makes it good at any of its uses. Now before I ask the obvious question, what in fact is the mind’s end, let me pause to drop a pretense. The student’s mind is not a tool or “instrument.” about whose use or end he can disinterestedly inquire as though his mind were a spare part he had somehow acquired. Your mind is you yourself. It is you as aware, you as thoughtful, as intelligent. So to ask what the mind is for. is to ask what you yourself are for. in one of your most indispensable dimensions. To ask after the mind’s end is to ask a personal question, therefore, not an academic one. Education is important because it makes something of you. That said. I proceed to the obvious. What is the mind for? What is its end? Surely this: to know and appreciate the truth. Laying hold of the truth, appreciating it in all its dimensions, is what the mind “does.” when it “does its thing.” The mind is a potency, and its “thing” is its act. That act is to know truth. The mind has uses in harmony with that end. and uses inimical to it. The mind can be used to invent lies or indulge fantasies, to cavil, to obscure, to propagandize. But in such uses the mind is perverted: it is turned from its true aim, from knowing truth. But what does it mean to know? for this one. I take a cue from Aristotle. We think that we “really know” something, or know it “outright.” says Aristotle. when we think we grasp the reason why that thing is. as it is. and couldn’t be otherwise (Posterior Analytics I. 2. 71b8ff). Thus any knowledge worthy of the name will bear upon causes and principles of explanation (Metaphysics e, 1025b6-9). This is an interesting point. Most people are vaguely aware that education is somehow different from job-training, and that education somehow leads the mind out of potency, out of ignorance, into the light and play of knowledge. But they think of knowledge as a stock of facts, and so. they think of education as a stuffing with facts. Aristotle disagrees. He thinks that the unit of knowledge, so to speak, is not a fact but an explanation. If he is right, then a true education conveys explanations, gives reasons, reveals causes, illuminates connections. Does it follow that “mere facts” are irrelevant? Of course not. Facts are the very things connected, the objects explained. The error of “progressive education” was to assume that students could be charmed with “concepts” and “connections” without the hard discipline of mastering the facts. Genuine education takes the facts and makes them intelligible by showing the connections. That is why genuine education can bore no one but the uncurably incurious. It is “preparation” only in this sense: it is bringing the student “up to speed.” up to the “state of the art.” in mankind’s greatest natural adventure, the quest for understanding. I must now broach a point of some delicacy and no little danger. I have piled up a rather high heap of abstract terms: know ledge, cause, explanation, connection. The danger is to suppose that these terms are univocal. Positivism succumbs to this danger by supposing that all know ledge is of one “scientific” kind, that all explanations are of the type used in. say. physics. The result is that education is distorted with a scientistic bias. A certain misguided Aristotelianism also succumbs, imagining that all knowledge is of essences and that all genuine explanations are of the kind used in metaphysics or (perhaps) in mathematics. The result is an education biased against history, literature, languages, and many other important subjects. (Rationalism compounds the same sort of mistake with an education biased against supernatural Revelation, which has be be believed rather than proved.) Humanistic historicism succumbs in rather an opposite way, supposing that all genuine knowledge is of human affairs and symbols, that all genuine explanations are “interpretations” of the kind used in history and in exegesis. It results in an education biased against the empirical sciences and against anything else which threatens to transcend cultural relativity. These are mistakes which education seeks to avoid at Christendom College. We are convinced here that ‘knowledge,’ ’cause,’ and ‘explanation’ are analogical terms. The behavior of an electron, the decay of a nation, the assumption of the Blessed Virgin, and the structure of a poem are such different things that the “causes” of one of them have no univocal likeness to the “causes” of the others: to explain any one of them is a different kind of activity from explaining the others. Yet all are knowledge. An education worthy of the mind should not leave it helpless at any of these explanatory tasks. This is why Christendom College has a core curriculum which is internally diverse. We want every student to acquire experience with the several analogates, the several sons of knowing: from grammatical construction to historical explanation, from political analysis to metaphysical deduction, from empirical verification to theological proof. For the same reason, our College has a variety of majors and electives. An education worthy of the mind’s end must do justice to the heterogeneity of that end. to the variety of knowing. A moment ago, moreover, when I stated what the mind’s end was, I didn’t just say “to know the truth.” I added “to appreciate it.” Appreciation adds the element of dynamism, the will to go deeper, to inquire further, to see more synoptically. Appreciation brings in the cooperation of the will, and even of the imagination. with the mind—not surprisingly, for mind and will and imagination are inseparable. Man is a totality. His mind cannot reach its end without the firing of the imagination and the annealing of the will in the love of truth. For this reason, the Christendom curriculum is not colorlessly analytical: it allows a large place for the vision of reality through literature, through the fey. ironic and polychrome light of artistic genius. Whence I come to another delicate point. I said at the beginning that education is different from all particular training. I stick to that, but I underline the word particular. For there is a broader kind of training which is pan and parcel of education. There is an aspect in which all real knowing involves knowing how. How to learn, how to study, how to explain, how to express, how to clarify, how to refute—these are all “hows” the skill in which, the practice of which, the training of which, is inseparable from education. From this fact we derive two things about our curriculum. On the other hand, the fact that education involves its own kind of training is the reason why our college seeks to put the student into contact with creative scholars, with men and women who are working and publishing at the frontiers of their disciplines. The student must “catch the knack, the adventure, the skill of knowledge, from those who are adding to it. Education—the leading of the mind towards its end. towards truth possessed with reasons, appreciated in its paradoxes, expressed in all its delicacy; so much for our noun. I turn to the adjective, ‘Catholic’. I turn to it with joy, not just because I am a Catholic, but because I am an educator. For if education s aim is the mind’s end. and if the mind’s end is knowledge without frontiers, of things mundane and things transcendent, of last ends and first causes, and all that lies between, then the small-‘c’ catholicity of education already cries out for the capital ‘c’ of Catholicism. To hunger for understanding is already to hunger for a perfection whose seat is above all ages, the eternal Wisdom of the Father, the Logos in Whom the Father expresses all that He knows, the Word through Whom all things were made. The ultimate joy of learning is to know in and with the mind of Christ. Now the job of an adjective is to modify, but how much it modifies its noun. ah. that is a variable thing and a matter of policy. On many a Catholic campus in the quieter days of the Church, thirty years ago. a course or two in Scholastic thought, a busy chaplain, a rumour of Chesterton and a look at Evelyn Waugh sufficed to make the education Catholic, or so it was supposed. Graduates departed with foundations of sand, and a post-Conciliar storm has swept them by the millions into a limp and broken apostasy. 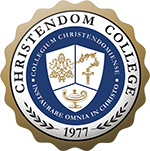 At Christendom College, we are determined not to repeat that mistake. We have fashioned a curriculum for Catholic conquerors. not casualties or mere survivors. We have fashioned it on the basis of our personal experience in the apostolates of Catholic social and political action, the special provinces of the laity. Our President. Dr. Carroll, and our founding faculty were all deeply involved in such apostolates before turning (or returning) to academic life; we had already encountered hundreds of young people alive with the Faith but hungry for solid formation: we took the measure of their needs—their need to know their historical identity as enemies of Reformation and Revolution, their need to know their political identity as agents of Christ the King, their need to know their intellectual and spiritual identities as champions of a timeless metaphysic and hearers of an eternal Gospel—and out of those needs we structured a core curriculum and five basic majors. Nevertheless, we are neither a seminary nor a retreat house. It is not the job of an adjective to swallow its noun. We are no nest of amateur parsons, making warm piety do duty for academic rigor. And nevertheless again, though being a college. with the intellectual finality of a college, we cannot and will not ignore our responsibility for the salvation of souls. The mind itself, as mind, cannot attain its end in Hell.